Israel Ybarra was born and raised in Donna, Texas. He had a humble upbringing, and was the first in his family to attend college. Israel credits a high school teacher and a culture of high expectations for putting him on the path to college. 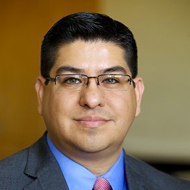 The high expectations he sets for himself lead him to not only earn his Bachelors, and Masters degree, but in 2006 he earned a Principal Certificate and in 2011, a Superintendent Certificate from UTPA. After earning his teaching certificate at UTSA, Israel returned to the Rio Grande Valley to teach A.P. U.S. History at Weslaco ISD. In 2004, Israel accepted his first administrative role as IDEA's Director of Curriculum and Student Support Services. In 2006, his knowledge and work experience led him to return to Weslaco ISD to oversee the A.P. program. From 2009 to 2011 Israel led Weslaco ISD's program for at risk youth and Social Studies curriculum development. Israel returned to IDEA as principal of IDEA College Prep Alamo only a few miles from his childhood home, where he coached students and teachers to tremendous success. In his newest role as Senior Vice President of Schools, he is committed to sending 100% of IDEA students to college.